There’s about to be a lot more activity at the corner of Killingsworth Street and 42nd Avenue. 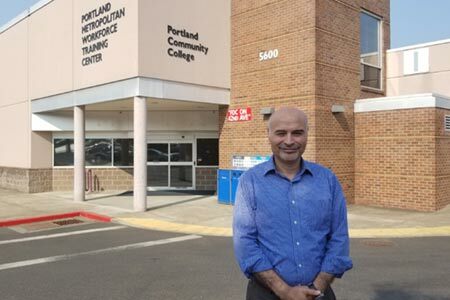 Thanks to the ongoing support of Portland voters, a $185 million bond measure was passed last year to provide Portland Community College (PCC) the opportunity to demolish the Metro Workforce Center’s two outdated buildings on that three-acre site and combine the programs into one multi-story facility. PCC is currently staffing up its Planning and Capital Construction Office and beginning the initial planning and coordination meetings with the team at Metro Center. PCC purchased the existing facility in 1998 and opened the Metro Workforce Center with minimal improvements. The two buildings are among the older buildings in the PCC district and no longer serve the workforce programs well, according to Rebecca Ocken, PCC planning manager. Completing this project will reduce ongoing maintenance costs by $2 million, she added. And it will enable the community college to continue partnerships more effectively with the Oregon Department of Human Services and other regional and community workforce development entities. Additionally, PCC is assessing the feasibility of providing affordable housing for students at the site. Student housing is very new to the college and will take some time to evaluate, Rebecca pointed out. However, it is of great interest to PCC administrators, given the pressure on Portland’s housing market and the growing number of PCC students who experience housing insecurity. PCC will ask community members for input during the planning phase, but isn’t prepared yet to name the timeframe. “I would anticipate a very broad and inclusive community engagement process,” Rebecca said. PCC wants to honor the community in regard to the Metro Workforce Center site with more lengthy, more across-theboard discussions over the next three to five years. That’s a new approach for the community college. “PCC values Metro Center as both a college and a community asset,” Rebecca said. Tamara Anne Fowler is a copy/content editor, fiction editor and accountability coach. Visit her at EditKitten.com, email her at Tamara@ editkitten.com or call 310.359.6038. She would love to hear from you. « Knock, knock, have you got a bed tonight?